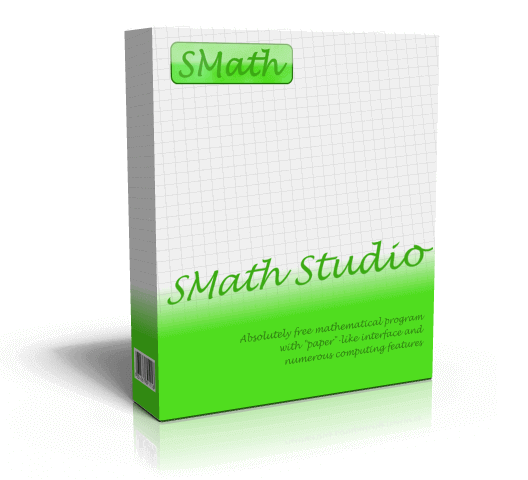 New Stable SMath Studio 0.98.6484 is available! Internal meta-data for Regions supported (within the program and worksheet files format). Document title corrected on printing (important for some printers). Fatal error related to stack overflow exception fixed. Nice. Then, the hint "* Changes will take effect after program restart" can be removed from the options tab of the settings dialog. Then, the hint "* Changes will take effect after program restart" can be removed from the options tab of the settings dialog. The portable version with plugins has been updated, follow the link in the my signature. 5 users thanked mkraska for this useful post. that means just patch for whatever codes that are new or refactored ? Objectively all should be transparent. Am I right/wrong ... don't want to damage 6179 !!! Perhaps you run the installer version of SMath 6179 (not the portable version). In this case, your installation is updated (you may also need to update some plugins). To try the new version without harming your existing one, use the portable version (see my signature for a link) as a sandbox. 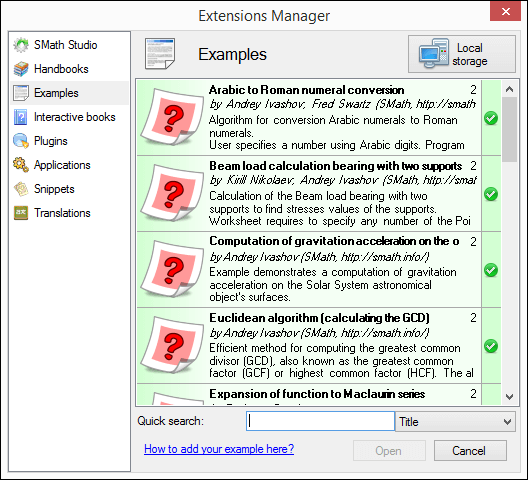 You simply unzip the archive anywhere and run the SMath exe in the new directory. If you like this version, you can declare it as default application for .sm file using context menu in the file manager (Open with...). 1. ComboBoxRegion puts the assigned variable (aka the result) into a matrix. Other functions which use this variable then throw an error because you are trying to use a vector as opposed to a scalar. 2. Include and areas - Include will not include variables inside of an area. Are these statements above correct? Include will not include variables inside of an area. "include" is wrt a referenced work sheet. If it does not work ... disaster ! Please test with these two. Genfit Algo Include.sm (14kb) downloaded 41 time(s). Genfit Algo Include Test.sm (17kb) downloaded 40 time(s). @JEAN - Your examples do not work form me once I save and refresh them. Reason being - "Genfit Algo Include" is inside an "Area Region". I tried to download an older stable SMath version, but I still have issues with Comobox plug-in. Is there a Combobox plug-in page I should post on? 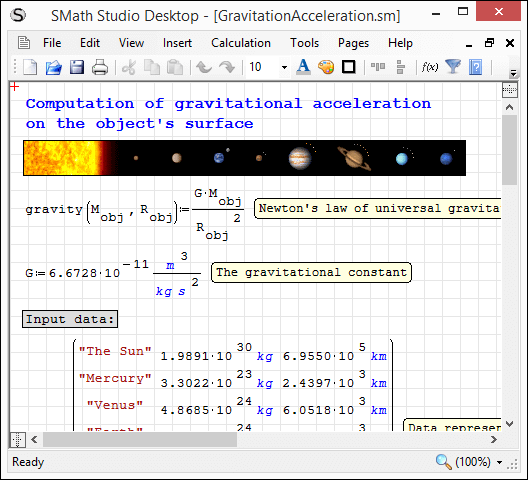 I'm not sure if it is a revision in the plug-in or the updated SMath. I'm not able to reproduce this, works fine for me. Is there a Combobox plug-in page I should post on? 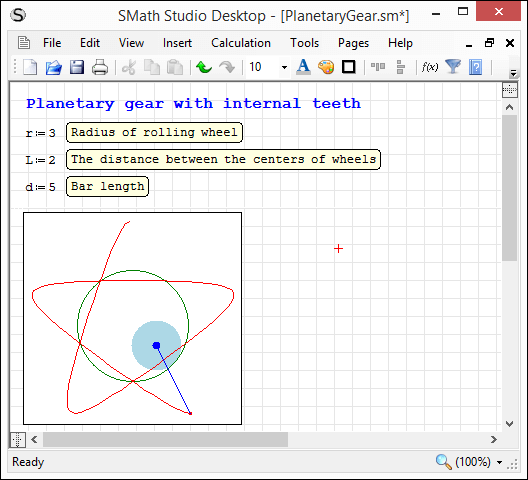 I'm not sure if it is a revision in the plug-in or the updated SMath. Better you open a new ticket in the BTS (attach there a small example that doesn't works for you). Regarding the combobox... I'm sorry, I misspoke. I meant to reference the ComboBoxList (insert -> controls -> ComboBoxList). There must have been a change when using "Output = item's row". 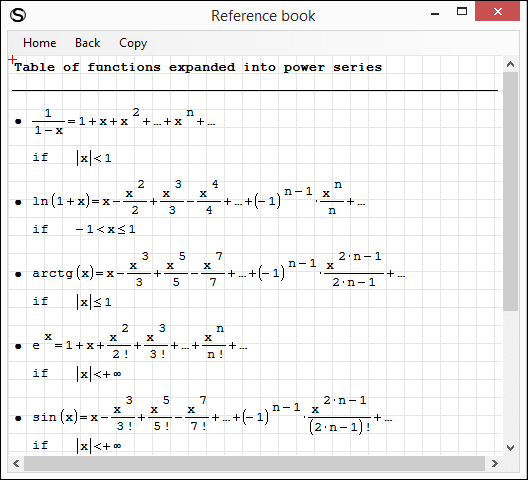 When I had used a column vector it would return the output as scalar. Not it returns it as in a matrix. This actually makes sense. I should change my sheets that that "Output = n-th element in the row", this would give me a scalar result. So the plugin needs to be updated? Is this doable or should I switch back to a previous version for the time being? I've got two issues, both started with the last update. When updating/reusing a sheet, I delete the variable information to update the sheet. Depending on what is going on, the auto recalculate with "crash" the program and re-start. Right now I just will in the number 1 as I gather the information. 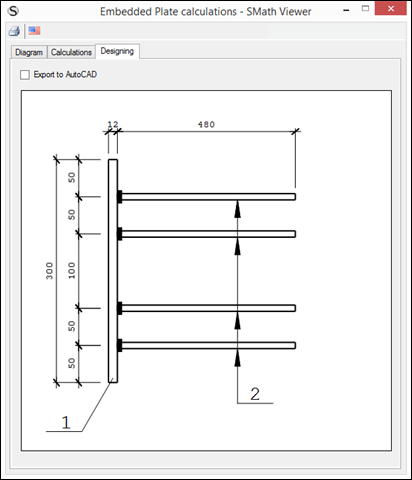 Hidden regions cause a huge issue when cutting and moving when collapsed. I need to open up the hidden areas in order to move them. So the plugin needs to be updated? @Davide - Thanks for looking into this. What do you suggest in the mean time? Is there a previous version that would allow this to work again? Or am I able to modify something that would allow the plugin to function "correctly". The "Include & Test" were created Smath 5346, still working Smath 6179. Make sure the "Area region Plugin" is installed. ComboBoxList issue.sm (5kb) downloaded 42 time(s). Could that be due to the number format setting? Seems that just two significant figures are displayed. However, if I open your sm file, the numbers are displayed correctly. It is due to that; numbers are rounded to 2 significant digits, as set in the options of both the regions. Set it to 0 to not have this behavior. If you mean that you can read "126". that's strange; I'll look if might be some localization issue.